Picturesonwalls dropped some new Sickboy prints last week, and while the hand finished edition sold out instantly, you can still bag yourself one of the standard editions of the pictured "Save The Youth" print. It's a three coloured screen print on 200gsm translucent vinyl!! The print is available here. 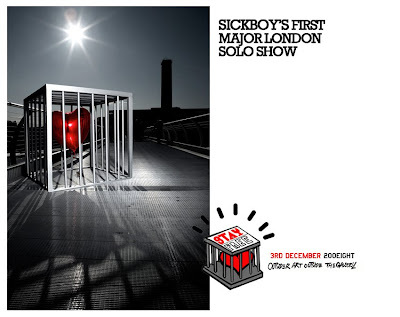 Other Sickboy news is the announcement of his first major London show. Opening in Shoreditch early next month on the 3rd of December, you need to "Stay Free" and get it in your diaries / iphones. The exhibition will be held at the Tramshed in Shoreditch. The show will run from the 4-10th with an invite only private view on the 3rd. To get yourself an invite head over to Sickboy's website to register your interest.